Peas Paratha is a healthy & filling Breakfast Recipe, made with Green peas as Stuffing. It is served with pickles or curd.Health benefits of Green peas includes they are rich sources of many minerals such as iron, calcium, zinc, copper, manganese etc. 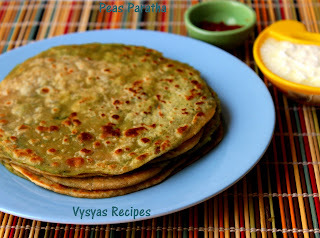 which enhances the immune system of your body.Fresh pea pods are considered as an excellent source of folic acid.So, peas are good for expectant mothers and the health of new born babies.Today we will learn to make healthy Paratha Recipe. Green Peas - 1/2 cup. lemon juice - 1/2 tsp. Take a wide vessel, add wheat flour, salt & oil. Mix well. Then add water little by little to make a soft and pliable dough. cover the dough & keep it aside. Now dough is ready. Steam cook the Green peas in a pressure cooker for 5 to 6 whistles. (Add water in a cooker & place the bowl with Green peas & cook for 4 to 5 whistles). Grind Green chilly,Ginger & salt,then add cooked Green Peas & coriander leaves & Grind it, little coarsely. Then add cumin powder & give a quick Mix. Now stuffing is Ready. Divide the dough into equal portions & make a balls. Take each ball, pat it lightly & make bowl shape as shown in the picture. (as we make for kozhukkatai). Then spoon it with stuffing,then bring the edges together & seal it properly as shown in the Picture. 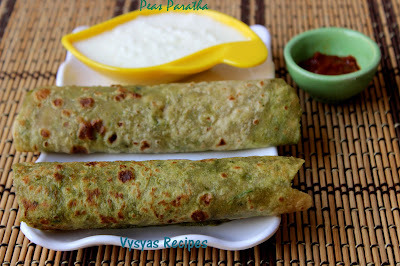 Then dust it with flour & roll Gently into thick Parathas. Cook on both the sides, till Golden spots appear by Drizzling oil or Ghee. Now Paratha is ready to serve. Always make soft & pliable for dough for softer parathas. When you make parathas, make a bowl, and place the stuffing inside, for easy rolling. Alternatively, if u can't make bowl, you can make small poori's & place stuffing in the centre then seal it properly. Adding cumin powder gives nice flavour to Paratha. I used fresh Green peas, you can use frozen Green Peas also.